The ability to record and playback media has profoundly shaped the way we view the arts and popular culture. Edison’s 1877 phonograph revolutionized the way we interact with and view music. With recording technology, music could be enjoyed in the comfort of the home by the average person. Edison’s Kinetoscope was patented in 1888, which Edison said it would do “for the Eye what the phonograph does for the Ear”. The birth of the motion picture industry introduced a new medium for artistic expression, and the television industry, emerging several decades later, allowed for the broadcasting of films and other programs into the home. However, film was expensive to produce and many early television programs were shot live and only seen upon broadcast. A cheaper and reliable method of recording video on magnetic tape was introduced in the 1950s, which completely changed the television industry and how we consume media. Magnetic recording has its origins in the late 1800s with Valdemar Poulsen’s telegraphone, a wire recording device used to record audio. Over the next several decades, numerous advancements were made to audio magnetic recording technology. In 1929 Fritz Pfleumer patented a magnetic recording tape using oxide bonded to film, and BASF shipped the first commercial magnetic tape in 1935, a foil of cellulose acetate coated with a lacquer of iron oxide bound with additional cellulose acetate. Magnetic recording was not used for video recording in the 1950s. Early motion pictures were shot on film with no accompanying audio track. A vitaphone, a phonograph based technology to sync a recorded disc with film was demonstrated 1922, and became a commercially successful technology. By the mid-1940s, RCA and NBC were experimenting with methods of recording by capturing projected films on a monitor. This type of recording was known as kinescope, named for Vladimir Zworykin’s receiver. Due to difficulty in editing film, many early television programs were broadcast live, some using short film inserts. Kinescope recordings of live broadcasts were cheaper than filming, but the quality was relatively poor. While some early television programs survive due to their kinescope recordings, many including influential programs such as the first episode of the Ed Sullivan Show and four episodes of The Quatermass Experiment remain lost. 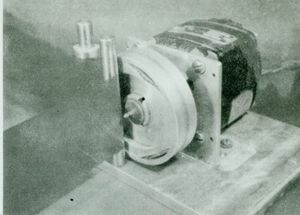 In 1949, Marvin Camras begun to work on developing magnetic tape for the recording of a video signal, and had drafted a mock-up of a rotary-head device. While he decided the idea was impractical, Camras was visited by Walter Selsted of Ampex Corporation. Bing Crosby had invested $50,000 in Ampex to develop videotape recording technology. Selsted was impressed with device and Ampex proceeded forward with the project, hiring Charles Ginsburg in 1951. Ampex gave the project a budget of $15,000 and in 1952 Ray Dolby was added to the project. The team demonstrated their first machine on November 19th, 1952, an arcuate scanning three-head machine that read tape at 30 inches per second. The arcuate scanning mechanism consisted of a spinning disk with heads mounted on its face which contacted the tape, resulting in an arc-shaped track across the tape. Other organizations were less successful in developing magnetic videotape recording technology. RCA demonstrated a recorder which operated at 360 inches per second in 1953 and the BBC began work on a device called the Vision Electronic Recording Apparatus (VERA) in 1952. VERA was demonstrated in 1956. It took input at 200 inches per second and recording time was limited to about fifteen minutes for a 21 inch reel of tape. The high speeds of the input led to instability in the machines, both in terms of the picture quality and mechanical failures. 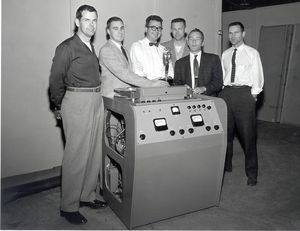 By 1954, Ampex had demonstrated two other prototypes, the Mark II and the Mark III, now using transverse scan technology. Transverse scanning machines mounted the heads on the headwheel as opposed to the face, and scanned the tape widthwise. The method of scanning was more reliable than the previous arcuate method. The Mark IV was introduced in 1956 at the National Association of Radio and Television Broadcasters Convention to an extremely positive consumer response. Based on its design came the VR-1000, the first video recorder commercially produced. The VR-1000 operated at 15 inches per second and could store 90 minutes of video per reel and retailed at $50,000. The initial sixteen units were all constructed by hand. In 1953, Ampex appointed Eric Schüller, a German engineer who had previously worked in magnetic audio recording, to their videotape project. His personality clashed with Ginsburg and he advocated for a helical-scan based technology, rather than the transverse scan technology to which Ampex had already committed research and resources. Ginsburg quit the videotape project in protest and Schüller was fired shortly afterwards. While Schüller’s role in the Ampex project delayed its progress, he applied for a helical scan patent shortly after his discharge from Ampex in July of 1953. Helical scan recording consists of tape being fed around spinning heads in a diagonal fashion, so the pattern of the recorded data on the tape is in the shape of a helix. Instead of being recorded along the width of the tape, helical scanning methods record on a diagonal segment of the tape, allowing for the ability to easily pause on individual frames, something which was not feasible with transverse scanning methods. Helical scan also allowed for far greater information to be stored on tapes, allowing for longer recording times on tapes. Earl Masterson of RCA applied for the first helical scan patent in 1950, but ignored its commercial potential. 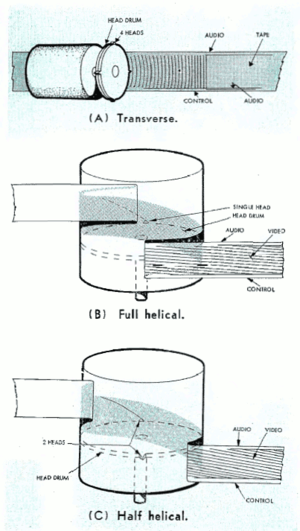 Led by Norikazu Sawazaki, Toshiba first demonstrated a helical scan prototype in 1959, and its tapes cost approximately one tenth the cost of the Ampex transverse scan to manufacture. Helical scan tapes were widely adopted shortly after. Ampex switched its technology to helical scan and produced the first commercially sold helical scan videotape recorder, the VR-8000 in 1961. Only four units were constructed as the unit was problematic and it was replaced shortly after by the VR-1100. Other companies introduced their own 2” helical scan formats, including Sony and Philips in 1963. Many of the 2” tape players were very large and not meant for portable use. The transition to smaller tape sizes addressed this issue. One of the earliest half inch videorecorders was the Telcan produced by the Nottingham Electric Valve Company, first demonstrated in 1963. Short for “television in a can”, the Telcan was intended to be be a domestic video recorder capable of recording 20 minutes of low quality video footage. Though commercially unsuccessful because of its high price, difficulty to assemble, and lack of color support, it was an early attempt at a new market for videorecording devices. In 1964, Phillips introduced the 1” EL3400 videotape recorder, marketed as a semi-professional machine, and in 1965 Sony introduced the ½” CV-2000, marketed for home use as a domestic recorder. The CV-2000 retailed between $1150 and $1400, depending on if camera accessories were included. However the CV-2000 tape was difficult to play between different machines because of instability with its skip field system. 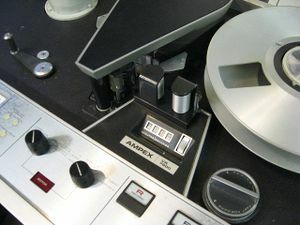 Ampex used several forms of 1” tape, Type A (1965), and Type C (1976); Type B 1” videotape was introduced by Bosch in 1976, and was used extensively in European broadcasts. In 1969, the Electronic Industries Association of Japan (EIAJ) attempted to standardize videotape format by bringing several different manufacturers together in order to agree on a single format which can be used between companies. This resulted in the Sony EIAJ format, a ½” video tape which was technically superior to the previous CV-2000 and became standard across many broadcasting industries. Reel-to-reel formats were cheaper to produce and duplicate than film but still had many drawbacks. Due to the tape’s open exposure, the tape could easily become damaged through environmental factors or misuse. Sony prototyped an enclosed cassette in late 1969, and in 1970 Sony, Panasonic and JVC agreed to use a standardized videotape. The U-matic was commercially released in 1971, and was the first practical videocassette recorder. It used ¾” helical scan tape in a sturdy, enclosed cassette, and its tapes were much easier to transport and play than open reel formats. Initial low-band models were capable of displaying 250 lines, and later superior performance machines could display 330 lines. While typically not used for home distribution of films, U-matic tapes were heavily used for broadcasting, and remained in use well into the 1990s. Other early videocassette formats include the Phillips Video Cassette Recorder, which leant the terminology “VCR” to the format, and CTI’s Cartrivision, both introduced in 1972. While both formats were ultimately unsuccessful, Cartrivision was the first format to offer pre-recorded programs for commercial purchase, including such films as Casablanca, Dr. Strangelove and High Noon. In 1975, Sony introduced the Betamax format, a smaller videocassette than the U-matic with roughly comparable quality, and JVC released the VHS format in 1976. These two videocassettes formats became incredibly popular for home usage. The two formats were in fierce competition with one another in Japanese, European and American markets in the late 1970s. The two formats were technically similar in quality with Betamax being slightly superior. Betamax was capable of displaying pictures with a resolution of 250 lines, slightly higher than VHS’s 240, and boasted higher sound quality and color definition. However, Betamax tapes were shorter than VHS and initially only were capable of holding one hour of video. By comparison, VHS could initially record up to two hours of video, enough to hold a motion picture of average length, and was often the preferred choice for home recording. By 1981, Betamax had only 25% of the VCR market sales, and the share declined to 7.5% by 1986. With the decline of Betamax, VHS became the dominant home video format for the 1980s and the 1990s and was relatively unchallenged until the introduction of DVDs. Digital video offered higher quality picture and audio which would not degrade over time or with multiple plays. VHS promptly became obsolete and the videotape became a thing of the past for most people. While digital video has replaced videotape for home uses, videotape has recently been in use by some niche markets. Digital video tapes (DV), first introduced in 1995 by Sony, became popular for use in camcorders. Coming in three sizes, DV tapes can record high definition video up to 1080 lines, equivalent in quality to Blu-Ray discs. 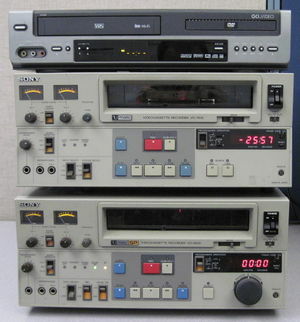 Other formats like Sony’s Betacam and HDCAM are still occasionally used in broadcasting and television production; however these uses are also fading fast. Today’s camcorders are phasing out DV tapes and moving to SD cards, which cut down physical space and allow more data to be recorded. Pfost, Fred, My Ten Years at Ampex and the Development of the Video Recorder. This page was last edited on 1 April 2019, at 19:13.